Like many of you, I love wearing clothes or jewelry that has messages or symbols in them. If a piece of clothing or an accessory has a meaningful (to me) message, I get bonus benefits from wearing it. I get the beauty of it, yes, but if there’s a symbol I resonate with, all the better. In some cases it makes me feel protected. In others I feel more grounded, more me. Sometimes I look up the meaning of an image (bees, fox, fish) and discover that it holds qualities that are aspirational to me. I can read the meaning and go, YES, I want more of that in my life. Then it’s like wearing a talisman to attract those qualities. Google Symbols and Meanings and you’ll find all sorts of meanings to items. It’s SO fun. It’s like reading your horoscope only better. I figure if symbols have been used for centuries, they must be beneficial to you and me. 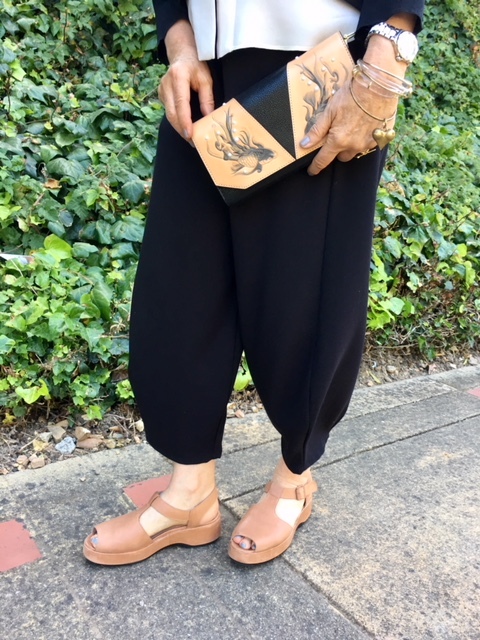 I was invited to style this fish black crossbody clutch by Bellorita, and it took a second to say yes. It attracted me in four ways. One: It’s beautiful, elegant, sophisticated. Two: Fish are big in our lives. We have a pond in our backyard that has koi fish and goldfish (big ones!). They swim around and around. Russ and I sit at the pond’s edge in our wicker chairs and watch them. He took this picture of them. Doesn’t it look like a painting? Russ is the keeper of the fish. He spends hours and hours on them. Years ago when Russ had a very bad bicycle accident (eleven broken bones, surgeries, ICU, wheelchair for three months) I thought, “Please, oh please, don’t let the fish die on my watch!” They didn’t. Three: I love Asian art. Our garden has Asian influences, and as we put our home together, we brought that feeling inside as well with antique Asian pieces. Fish are literally “home” to us. Four: I love the symbols of fish. In his reply, Alec gave me information about the artist’s choices. Here’s some of what he told me. Fish represent not only elegance and beauty, but endurance, perseverance and swimming against the tide; symbolic of showing no fear when presented with life’s challenges and overcoming great obstacles that lie in ones’ path. A most auspicious fish and one worthy of the enormous attention we place on carving the flowing fish on our handbags. The water drops formed by the swimming fish are expressed with natural pearls, embedded into the leather. The delicate pearls suggest purity, dignity, nobility and of course, pearls of wisdom. There’s an abundance of meaning there that I can grab on to. You too? I relate to endurance, perseverance, swimming against the tide and overcoming obstacles. If you’ve been blessed to have lived many decades, there have probably been a few obstacles you’ve overcome. 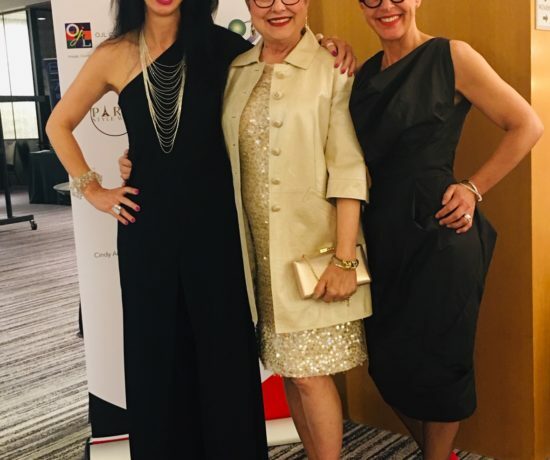 For me I think of the difficulty of going through a divorce, the perseverance of turning my image consulting jobette into a career so I could provide for my children, the challenges of going through cancer-twice, and facing the loss of loved ones. Fish say a lot about life, the things that build character. And they speak to the future. Would anyone turn down prosperity, harmonious exchange, and peace? Not me. I think those qualities are great ones to bring into my older age and the old age that I’m preparing to have after that. Let’s style the fish clutch. In order to give the fish all the space they need to say everything they represent, I kept my outfit quite simple. I like to think its theme is simple elegance. 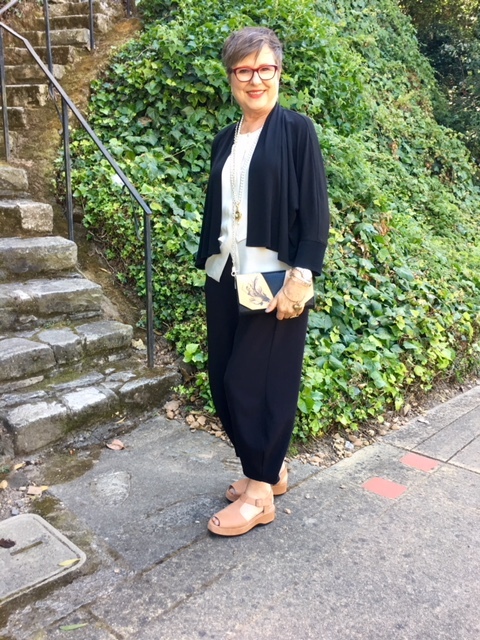 The core pieces are my Lisa Bayne wool crepe barefoot pant from Artful Home. (They have them in this style for summer in a jersey fabric.) They have an artistic elegance to them. The shape adds a nice creative touch to the look. My inner piece is a buff-colored silk sleeveless double-layered top by Theory from eons ago. I need three more inner pieces like this in different colors. 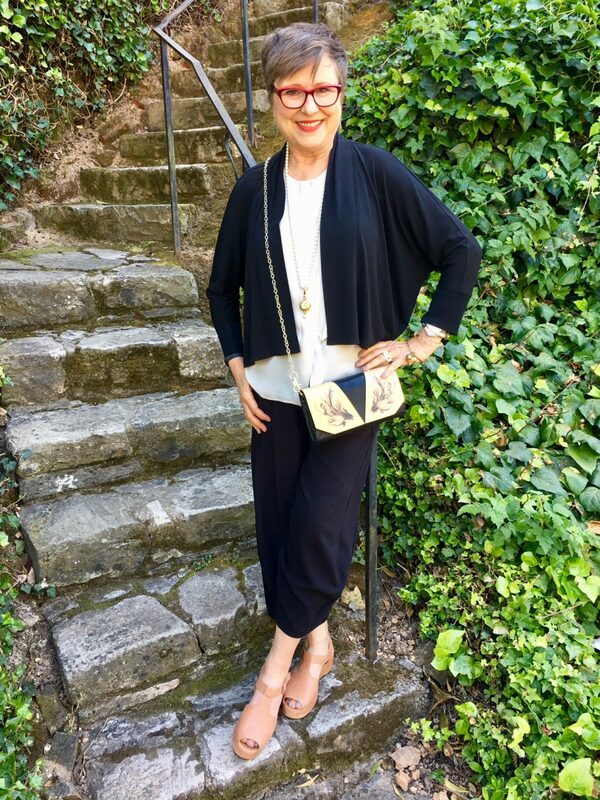 It’s so terrific for adding a touch of elegance to an outfit. 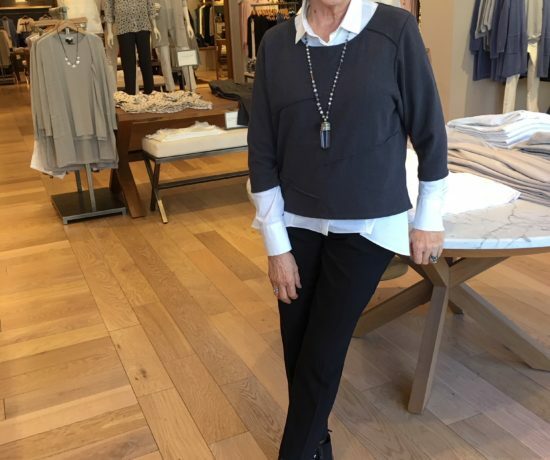 My outer piece is a black silk super lightweight cropped Eileen Fisher cardigan. It’s been a longtime friend of my wardrobe. I love that it’s silk and fluid. Again, it emphasizes that elegant note I’m going for. I decided to repeat the pearls that are on the clutch. The pearls are creating bubbles as the fish swim around. There’s a touch of whimsy hiding there in my long strand of pearls. The pendant part is a Mickey Mouse watch. I bought it at the Petaluma Antique Faire in April. It looks totally ladylike until you get up close and notice the Mickey Mouse ears. 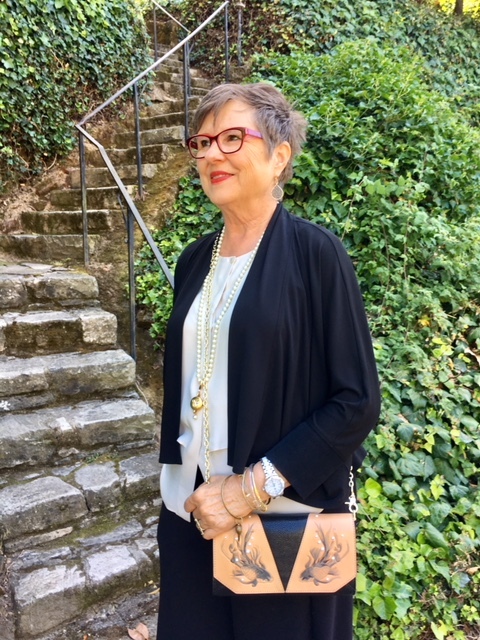 I wore my Victor Sanz owl ring and then an array of thin bangles. I like wearing this lightweight bracelet bundle on warmer days. Oh, and yes, my summer sandal, the Camper platform sandal. I seem to have found a sandal that goes with nearly everything I’m wearing this summer. I wanted to keep a lighter feel to the outfit and that’s why I did not wear my identical black Camper sandals. There you have it my friends! 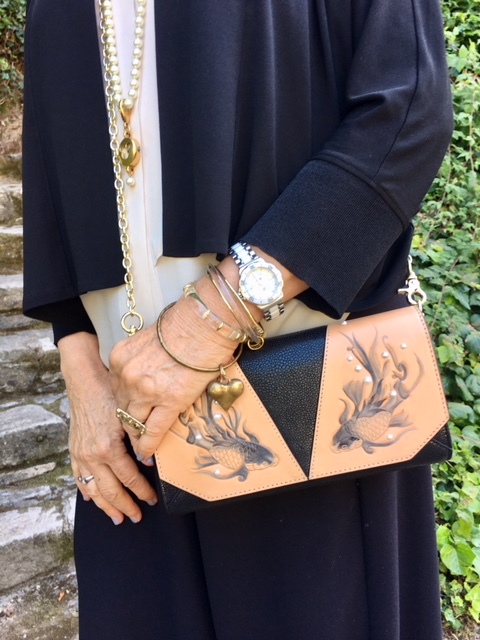 A fish-fabulous outfit showcasing this goldfish clutch with resonance galore, hints of hope for a lush future, and a great conversation starter. So let’s get this conversation started! Do any of the meanings of fish call to you? Endurance, perseverance, swimming against the tide and overcoming obstacles. And how about harmony or marital happiness? Does anyone need more fish in their lives? This post was sponsored by Bellorita.com. 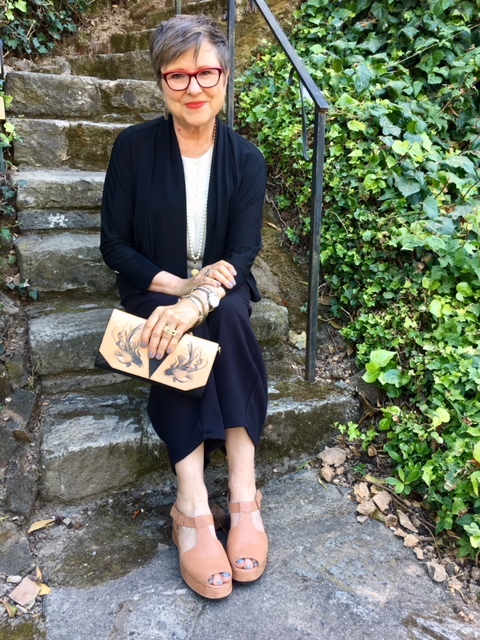 Thank you so much for sharing this beautiful clutch with me! Do check out the other artistic, unique handbags they carry. They are gorgeous! That is a beautiful formal bag and a wonderful understated outfit that really lets the bag shine. 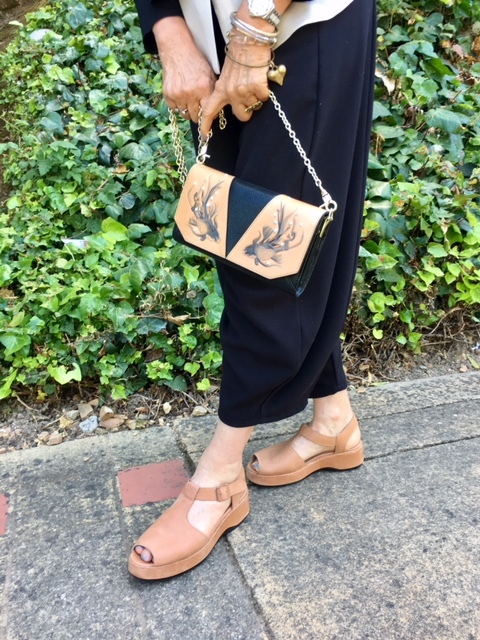 I love the sandals picking up the colour of the bag and making the whole thing more summery, that and the fact that Mickey has put in an appearance! I’m sure you know this, but the fish is an early Christian symbol for hope and solidarity. That’s very cool! And I love the outfit! I’ve seen a few bloggers feature this handbag. IMHO, you’ve showcased it best. I like that there is no competition to the bag, yet you have a casual, elegant outfit where everything shines, but nothing is a show-hog. I love the story from the artist. I have had koi in the past in another house with pond, and they bring calmness when you sit and watch them. One was even featured in the local newspaper. She was over 2 feet long and named Flutterbye. I miss the fish. The purse/clutch is beautiful, and I would use the blue one. 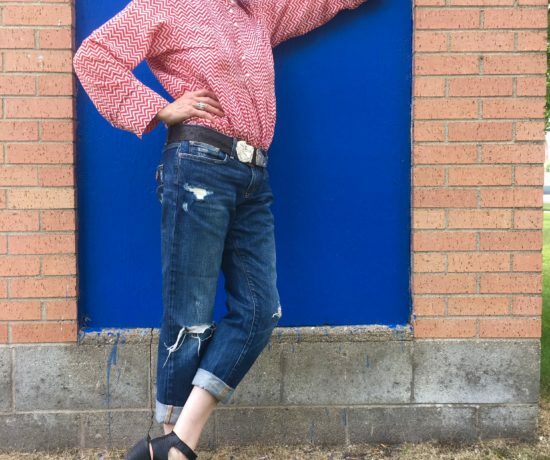 It could be styled with a very casual jeans outfit for fun as well with the wrist strap. By the way Brenda, did you see the new French Kande bee necklaces? I thought of you as soon as I saw it. A new bee collection, how much fun. Love all the wrist adornments. 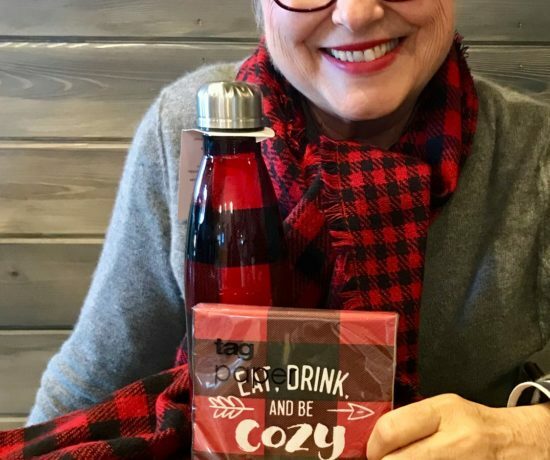 Isn’t it such an incredible bag, Brenda?? I’ve never been one for spending much on purses, but after getting this one, I can start to see the reason. It’s so well made and absolutely gorgeous in all respects. I love that you went with a more simple outfit to showcase the purse. As always… informative, inspiring and incredibly wearable… anywhere! Thank you. I had no idea that fish symbolized so many positive and spiritual aspects. Thank you for this education. The ensemble you’ve assembled here is striking, classy, elegant. You’ve given me an idea about what to do with a jacket I bought a couple of years ago that I’ve never really gotten into (literally or metaphorically) — now that I have a new-found respect for what fish mean in the ancient Chinese culture. Can’t wait to figure out how I’m going to combine it with other pieces. That bag is really interesting. Leave it to you to investigate its relativity I do know that in vintage jewelry the fish plays an important part in Chinese lore. You are amazing how you can style up the simplest thing and make it FABULOUS!!! I am in awe of you! Simply brilliant. And now I have to introduce fish into my wardrobe…Oh wait – I have a fish-patterned waistcoat hanging up in there! I shall give its symbology due respect next time I wear it. Thank you for your wisdom, as always. So glad you shared that whole image of fishing with your dad. I do love being out on the water as well. I was good at putting the worms on the hooks (it’s kind of like sewing) but happy to watch others do the fishing. Such fun to be remembering that! Thanks! And sending bushels of love from Sonoma. Speaking of paintings, You must look up Joseph Raphaels paintings of fishes, Beautiful. 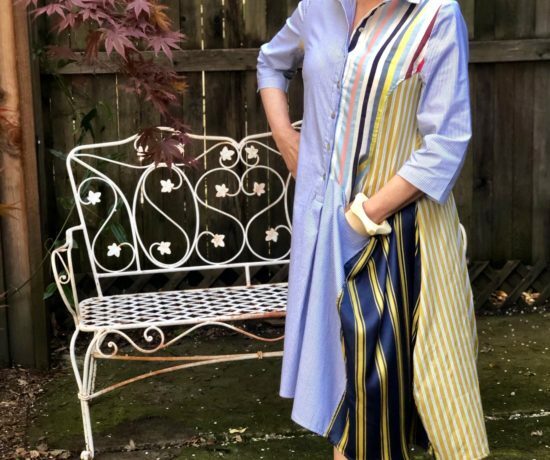 You always know how to put together the best looks. Yes, I’ve met Joseph! How fun that you mention him. 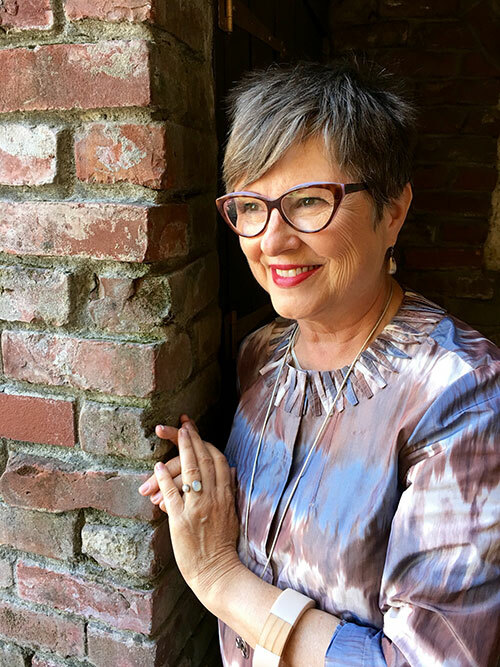 Joseph’s former wife, Judy, is a friend. In fact she and my twin brother were in a relationship after she and Joseph split up. I met Joseph and Judy when I first came to Marin County in 1982. They were sharing a studio at that time. Small world, Sandra!!! 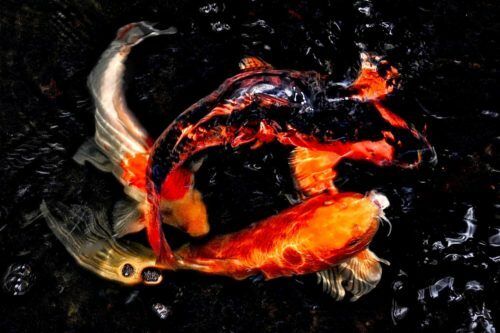 FISH,,,,,,,,we too have GOLDFISH NO KOI.I love watching them go round and round. The meaning is POWERFUL thats for certain! I have never liked FISH jewelry………………YIKES! Maybe I better re-think that! 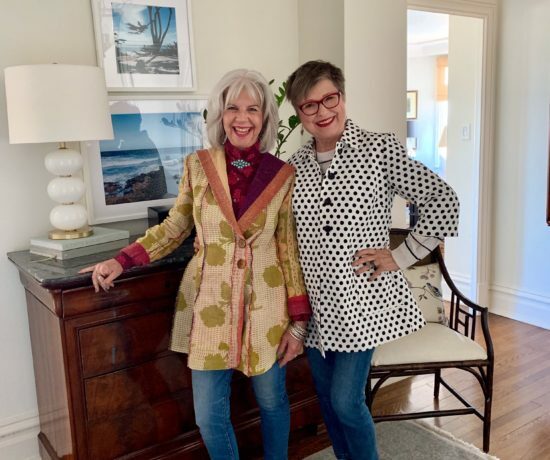 YOU look SMASHING………..come visit me and CINDY we have the AGELESS STYLE POSTS UP!!!!!! !FUN LADIES!!! Will come and visit! I can’t wait to see your koi! Just got back from LA and saw the most wonderful koi pond. I mean, WOW!